Having been attending beginner’s classes led by Paddy at Santosha for 2 years prior to undertaking the 200hr YTT, there was always a friendly and comfortable atmosphere in the studio which was a big appeal for me. A combination of factors gave me a gut feeling which put me at ease: I observed how everyone was treated equally, always greeted by a cheerful welcome from Paddy & his team and how the studio hosts an environment dedicated to nurturing an authentic yoga experience. Researching the programme prior to signing up, Santosha committed to providing a progressive structure of leading trainees on a transition of learning, discovering and personal development; the needs of the students have been foremost - as the Course Director, Paddy takes great pride in ensuring that the quality of the teaching is world class and as well as delivering a significant proportion of the course, has been present throughout. Timeframe – perfect for my lifestyle, the syllabus is broken down into manageable weekend segments (roughly one weekend per month) with adequate time to complete assignments in between; this approach fostered a healthy balance to enjoy completing the course amongst the many demands of work and life. On a practical level, it has given me time to progressively build on my physical ability and increase my knowledge by enjoying the recommended reading list. So, as I approach the end of my course I completely understand how the timeframe allowed me to absorb, mentally and physically, all of the course material, something which I feel has added real depth to my understanding of this ancient practice. Content – The course has been mindfully composed to create a syllabus of modules which are synchronised to complement and reinforce the various components in a relatable and manageable way. The content is rich in a well-rounded and evenly distributed variety of the physical, philosophical, anatomical and the business requirements of qualifying with the 200hr YTT. Clear communication of all aspects via teaching style, layout, instructions, and images have led to discussions built by the obvious wealth of experience and knowledge of the teachers. Material – an abundance of really helpful and easy to reference material provided at each class created a manageable learning curve and a fantastic resource to take away. As a visual learner, I found the approach of the classes involving group work and discussions around the content really helpful in obtaining, digesting and retaining the information. Managing our expectations, we would be given home assignments to reflect on the weekend’s learning followed up with encouraging feedback. For the 2 exams, the teachers were fantastic at providing material and support to prepare the students; as a result, I am thankful for this component which took me out of my comfort zone and helped to discover a confidence in my ability as a yoga teacher. Structure – this has been clearly based around creating the best experience for the student, I have thrived in the structure of Santosha’s 200hr YTT. Centred on the needs of the students, you can feel that it has been deliberately designed to draw out the potential in each and every individual. Flexible, understanding and supportive, consideration was always given to accommodate individual needs. My particular favourite aspect was the nature of discussions throughout the course – there was a consistent level of student engagement with enquiring minds which, I feel demonstrates how motivated the students were by the teacher’s enthusiasm for yoga. 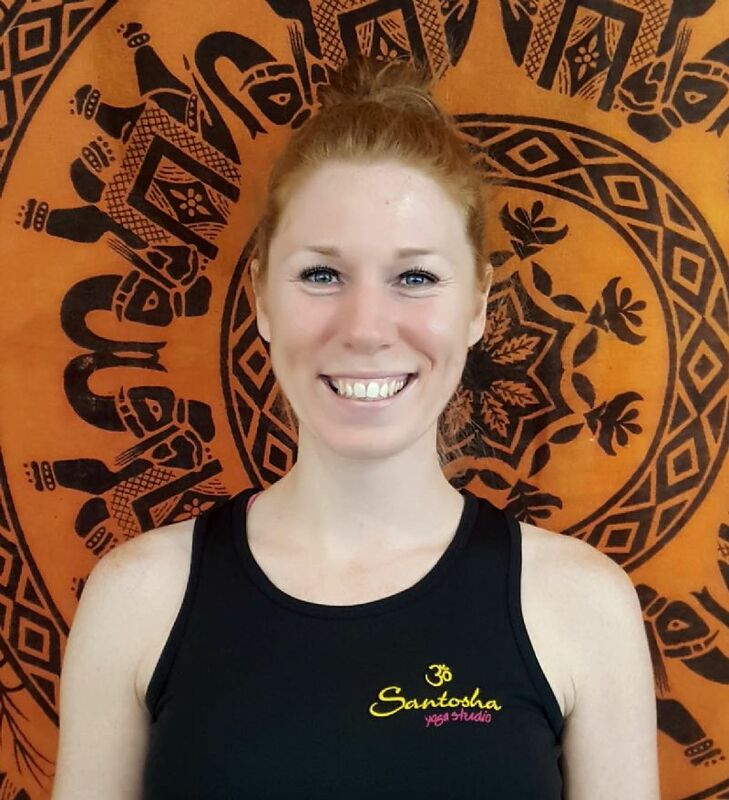 Tutors– humble with their approach, Santosha’s teachers are specialised and professional with a true love of yoga; the energy brought to the course by the teachers has been a real gift for the students. As well as the wealth of experience in their subject areas, between Paddy (Course director and lead tutor), Michael (Philosophy), Paul (Anatomy) and Kay (Presentation Skills) the teaching style has been inspiring, nurturing and fun. Every single class has been delivered with an obvious love for yoga and a teaching style creating a relaxed atmosphere; our laughter and chatter often filled the studio as we explored the syllabus - all questions were welcomed and answered in a way that we all felt supported and understood. The teachers lead us in the comfort of a group dynamic to feel supported yet we are encouraged to explore our own resources and take ownership for our experience on an individual level. It has felt on a personal level that I have not only been fortunate enough to find inspiring teachers for completing the 200hr ytt but also, mentors for a lifelong journey. An additional benefit for me has been the access which Santosha has provided for workshops delivered by world-leading specialists and the weekly schedule hosting a timetable for varying classes. Each opportunity has allowed for the learning from the 200hr ytt to be enhanced and magnified. So, if you are thinking about doing a teacher training course think no more – Santosha Yoga has the highly experienced tutors, the material and the venue to support you on your journey – the time for thinking is over – I would highly recommend that you act!